Yesterday (Sunday 23rd March) was my second time trial, Hemel Hempstead CC's Sid Latchford Memorial, a tough hilly 25 mile course up Bison Hill, over the Dunstable Downs and up Ivinghoe Beacon. 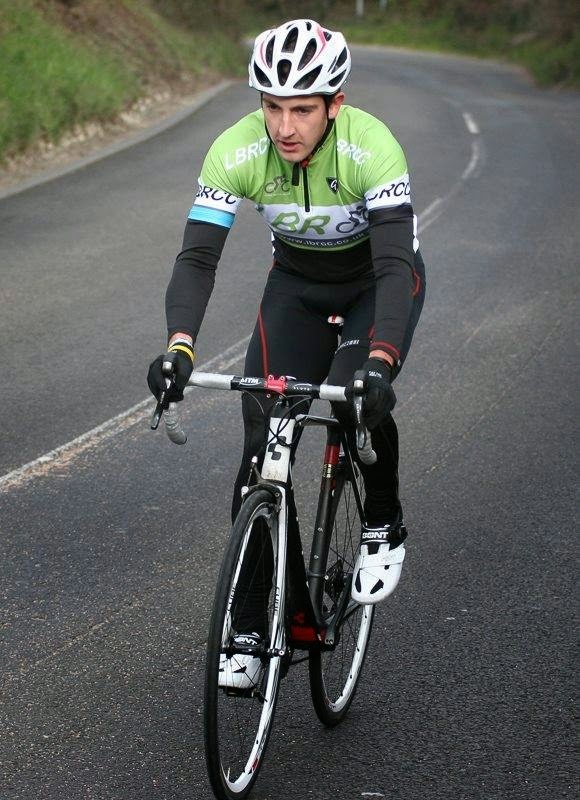 It was also my first in LBRCC colours, as the kit had conveniently arrived last week. My preparation for the race hadn't been too great, my one ride in the month before, a recon of the course, ending in abandonment due to ongoing knee issues. Added to this was a 2 hour squash training session Saturday and a late night after a meal out with friends! If that wasn't enough, as a result I then woke up late, ate breakfast too close to the race and didn't have time to set my new cleats and shoes up properly. If ever there was to be a manual of how NOT to prepare for a race, I think I would have ticked all the boxes! 'Fail to prepare, prepare to fail!' comes to mind! Anyway, despite this I made it to the start with about an hour to go, and got ready to warm up. All of a sudden, the brisk but sunny weather turned, huge globules of freezing rain coming down! Ten minutes of shivering pedal spinning later, I gave up, deciding that being warm took precedent today! Soon it was time to set off, which I did a little more confidently this time with the standing start. The bottom of Bison Hill...Short lived smile! The first 5km or so entailed a steady incline, maybe 1-2%max, which I was careful not to overcook after last time's overenthusiastic start. I made it about 4km up before being passed, but I wasn't too bothered, with TT bikes having a massive advantage on this stretch, especially with a fair headwind. A right turn at a roundabout and an ever increasing gradient led to a sharp right and the first climb of the day: Bison Hill, an eye watering climb touching 17% gradient in places! I'd reconned the climb last week, and thought it was tough but manageable, however, on the day I felt empty at the bottom, and really struggled up. I decided rather than blow out trying to push, I should spin it up and conserve energy for the several remaining climbs. A cowbell and cheering crowds spurred me on towards the top, no doubt finding my gurning entertaining, and a decent past Whipsnade Zoo followed. The top...I'd quit cycling 3 times by now! Going up here the thought of quitting cycling crossed my mind several times! A cross between no warm up and late breakfast were a bad combo, with muesli threatening to make a reappearance several times...(sorry!). As it turned out, despite the horrific feelings, I actually did the climb only 10 seconds or so slower than recon, so I must have done the first bit a little too quickly I imagine. Anyway...There was a short gentle climb up from Whipsnade up onto the Dunstable Downs, where a tremendous headwind greeted us. Great for the hundreds of people with kites, not so much for a suffering TT'er! It was a head down and drive moment with a slight recovery down a steep gradient into Dunstable. From here there was essentially a valley, a few miles downhill and the same up the other side, with the pleasant (!) addition of a headwind. I was passed a couple of times on the downhill, once again the advantage of TT bikes was evident, but it turned out both ended up in the top 5 overall, so not too disheartening! The uphill led to the second main climb of the day, Ivinghoe beacon, so with the wind, I held back a little, saving energy. Ivinghoe Beacon is a couple of km long with a fair gradient of 5% or so, which I really enjoyed on my recon. Feeling a little more energised, and safe in the knowledge it was downhill from there, I went for it, catching someone in the process. The last section was tricky, being a little steeper, but overall pretty good. Jenny was waiting at the top, fortunately missing a photo opportunity as I gasped 'It's not a good day at the office today!'. From there onwards the course was mainly downhill, first a smooth downhill which I mostly used to recover, and then a sharp left turn leading to a steep couple of km over very rough tarmac to the first and last roundabout. A right turn opened up the final stretch downhill back to the finish, which I managed full gas, crossing the line (which was earlier than expected!) in 1:04.50. I would have liked to beat the hour, but given the preparation and how bad I felt, beating 1:05 wasn't too disappointing. I definitely think I could get sub 1 hour, which may seem optimistic, but all things considered, especially the fact I haven't been able to train for 6 weeks, I think it is easily within reach. At the finish I stocked up on coffee and cake, and bumped into fellow rider Tom, who was somewhere between pleased and heartbroken with his time of 1:00.03! A fantastic ride, but so close to that magical marker! However, after we deduced that sprinting to make up that 3 seconds would almost certainly have lead to a catastrophic death (long story induced by post TT delusion! ), he seemed more happy! It was good to meet a fellow team member, as I haven't really had the chance to meet so many yet, having pretty much joined the club and got injured on the same day! The winning time was a blistering 50.03 by Micheal Broadwith (Arctic Tacx), and we hung around for the presentations. Overall, great organisation by Sam Williamson of Hemel CC, and all of marshalls, photographers, coffee makers and everyone else! Especially for the first time the event has been run. If you do go for a meal and get back at 1am, don't wake up and eat breakfats late, it will come back (literally and metaphorically!) to haunt you! As for my next plans, I really need to sort this knee out. I'm going to get some proper physio , fortunately LBRCC is sponsored by The Brecon Clinic, so I'll try there, and stay off the bike for a few weeks. Fortunately the weather should only get better, so a few weeks now is worth it to be ok for summer. It's a shame I haven't been able to race the MK Bowl circuit, but there will be plenty of opportunity over summer. There's a few weeks of the squash season left, so I'll focus on that rather than the bike, and combined with a week of reltive rest/warm weather training in Cyprus, hopefully my knee can recover! It was kind of disheartening at first being 15mins behind the winner, but as I was packing away the bike a thought occured to me. This is what the top guys train for all year round, most days. If I look at my level at squash, which I generally spend a couple of hours, 6+ days a week doing, then it's definitely comparable. I can beat full time professionals, some in the world top 200 or so, which when you think of pro riders speeds on TT's, these guys wouldn't be near. I know there's a lot more pro cyclists than squash players, but the performances must be close. A little nugget of positivity to top the day! Thanks Tejvan, I think it would have been a good course for you. Physio is definitely my next step I think, it doesn't seem to be going on it's own. Incidentally, I've put a link with your logo on my 'Recommended Blogs' page, is that ok?